There are lots of great classes this Fall, so check out any class in your area. There are classes coming up all over the country, so look for one close to you and register today before they fill. Even if you are skilled at using the markers, taking a Certification class gives you a chance to work hands-on with one of our fabulous Regional Instructors. Our instructors can troubleshoot problems with you and give you pointers on how to take your work to a new level. Don't wait another month- take a class now! Sept 22nd Orlando, FL taught by Jenn Balcer Filling FAST! Oct. 29th Portland, OR taught by Colleen Schaan applications have not gone out yet. 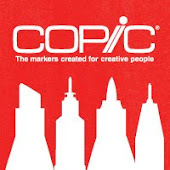 Also, be sure to check out the Copic Oz blog for events and workshops in Australia. This is just a note- If you are interested in attending the Hawaii classes you need to register right away! Those classes are filling very fast and space is limited. Contact nancy@copicmarker.com for more details. 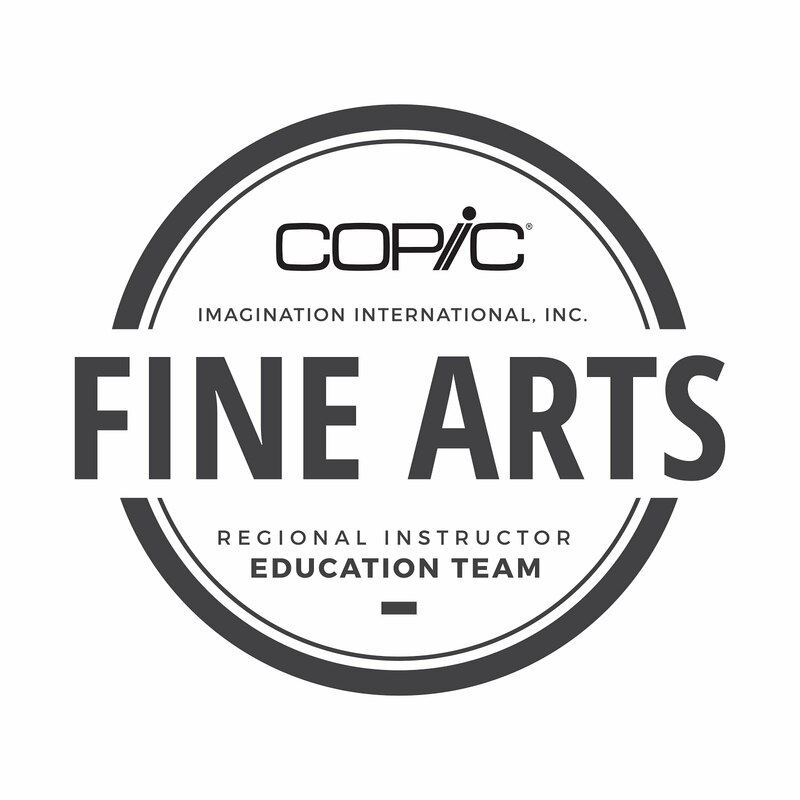 Next week we will begin accepting applications for a special Hawaiian Copic Certification event. I will be teaching all three classes, and I know it will be a fun experience for everyone! 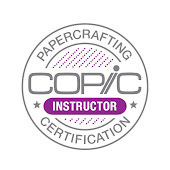 If you have not taken a Copic Certification class yet, then this is your chance. For this one event, you will be allowed to take Standard Certification then immediately take the Intermediate class. You must register for both classes at the same time if you wish to participate in both! Space is VERY limited in these classes, so you will need to register right away to take advantage of this opportunity. Anyone registering must pay a non-refundable class fee upon registration. No Exceptions. People who wish to re-take will be put on a waiting list, as top priority for this event is for those who have not had the opportunity to take Certifications before. I look forward to seeing you in Hawai'i! I want to thank those of you who stopped by the city of Eugene, Summer in the City event. I had a great time sketching and seeing lots of different artists and styles. 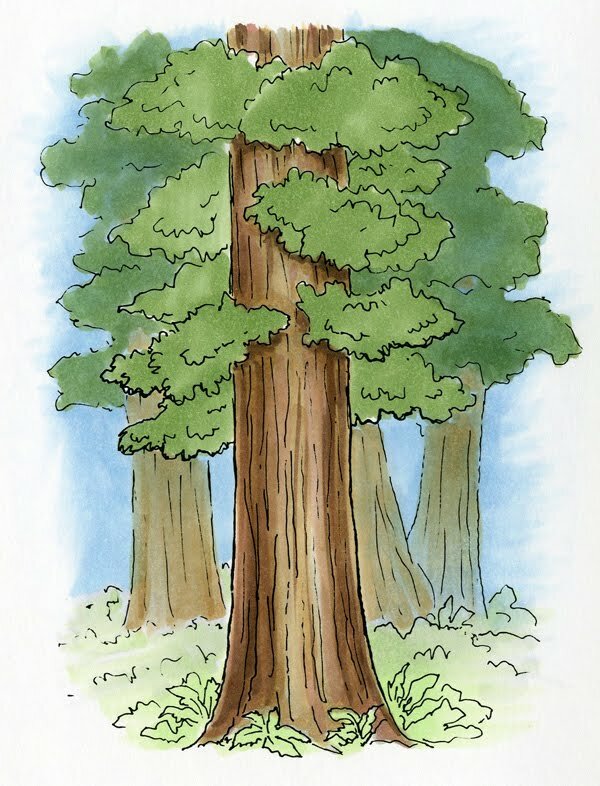 Meanwhile, I recently returned from a vacation to the Redwoods in Northern California. Although it is only about 5 hrs. 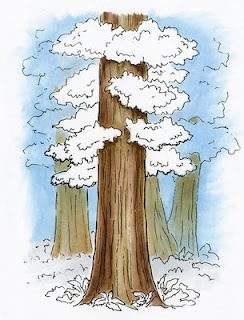 from where I live, I have not visited the giant trees since I was a kid. 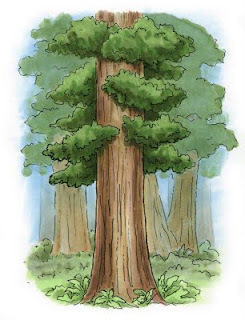 These quiet, tall giants grow dense & thick in the beautiful forests near the coast, and are a peaceful reminder of how big things can get if we leave them alone. 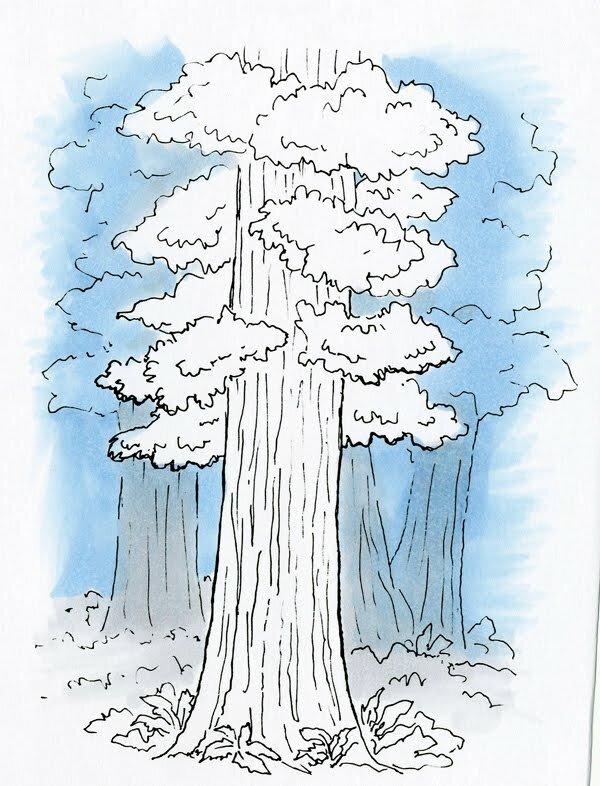 Today I wanted to show you a quick drawing of the redwoods, and how I colored this simple, quiet scene. We have one tree in front, with a few trees behind, in the distance. The overall tone of this image will be greens and browns, but remember, things in the distance have more blue, so I went ahead and colored everything behind the front tree with B41 and then colored tree trunks with C1. I'm not worrying too much if I go over the lines, since blue is a base color for green. Next, I added a base tone of E31 to all trunks, front and back. The back trunks dimmed immediately from the layer of blue. The foreground trunk remained pure, but too vibrant, so I added W3 to neutralize it a bit, then streaked in E47 and hints of E04. The pink of the E04 helps make the front tree warmer. To make the trunk appear rounded, I darkened the edges of the trunk more than the middle. Also notice, that you can begin to see shadows from the foliage on the trunk. Next, I add the base tones on any green areas. First, I started with a base of YG11 on anything on the ground. Notice how the gray immediately tones down the YG11 in the background areas. Next, I added YG63 to any of the branches above. You'll notice that the YG63 on the front tree is brighter than the YG63 on the back trees. Again, it is because of the blue base. I added a bit more YG41 to any areas on the back trees that seemed too vibrant. Without shadows, the foliage looks strange and flat. The last step in any of my works is to come back in and finish up my shadows. At this point, I darken the foliage on the front tree with YG97 and blend it in with YG63 and YG67. I added hints of YG11 to brighten up the strongest highlights. The foliage on the ground was darkened with YG63, G85, and YG11. Last, I added hints of trees even farther back. I lightly drew in some lines with a regular pencil then lightly brushed in E31 for trunks. For the foliage, I took the B41 and used tip-to-tip blending to lightly add touches of YG63 for the upper branches. Overall, I am pleased with how well this simple sketch came out. You can easily see the depth in the forest, and the strong contrast on the front tree really heightens the perception of depth for the whole picture. Notice also that I did not leave any areas white. I did this on purpose. In this image, I wanted to really show the quiet, bold, stillness. This is to be a peaceful, resting image, not focusing on vibrant life. By eliminating white, I cut my levels of contrast for the whole picture. Instantly, the image feels calmer. For an example of how the picture changes when I add white, you need to jump to the tutorial on the Copic Blog. 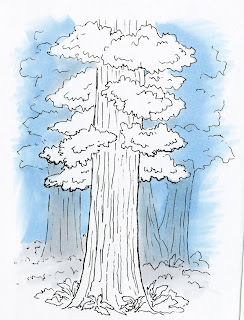 On that post, you can also download a free blank image of the redwoods to color on your own, so check it out! Thanks for stopping by! I hope this inspires you to go color (or hug) a tree today. Time once again for a list of upcoming events and certifications. Once again, I want to thank the people who came to the drawing event held last week in downtown Eugene. A local newscast interviewed me during that event, and here you can see that video showing how much fun I had sketching with markers. Here is a photo of one of the drawings I sketched while at the event. This piece is about 18" x 24" (I think), all drawn with Copic Markers. Any of the drawings I made can be viewed through Eugene Storefront Art Project (ESAP) at 200 W. Broadway. This Friday is the 1st Friday artwalk, so be sure to get out there and visit your local art galleries. Artwork drawn during the event can be purchased as a fundraiser for ESAP for $25. There are lots of great classes this Summer, so check out any class in your area. Now is the time to finally get Certified if you've been putting it off. There are classes coming up all over the country, so look for one close to you and register today before they fill. Even if you are skilled at using the markers, taking a Certification class gives you a chance to work hands-on with one of our fabulous Regional Instructors. They can troubleshoot problems with you and give you pointers on how to take your work to a new level.